Take junction 10 from the M9. Follow the brown signs towards Loch Lomond. Take the A811 west for about 10 miles. Turn left at the roundabout signposted Fintry and Kippen (B822). Continue up the hill into Kippen. Turn right at the crossroads by the war memorial before the Cross Keys. You are now on Fore Road. Go down this out of the village and Larne Coachhouse is the next house on the right after the national speed limit sign. Take the A82 from Dumbarton. After about 5 miles turn right onto the A811 at Balloch. Continue on the A811 for about 18 miles, following the signs to Stirling. After Arnprior take the right turn to Kippen. 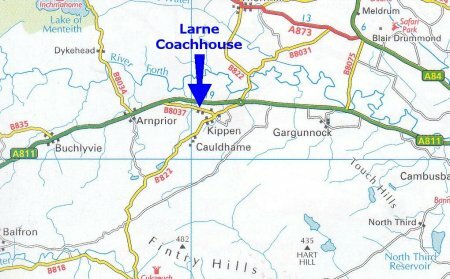 Larne Coachhouse is about 1 mile on the left, immediately after to the 'Kippen' sign.